With the rising trend of compact, portable handheld electronics, Sunon offers the Mighty Mini fans and blowers for a variety of mobile device such as PDAs, smartphones, tablets, GPS modules, handheld game consoles, pico projectors, portable media players and hard drives, and many more. The Mighty Mini fans and blowers are world’s smallest, thinnest, and lightest cooling fans and blowers, measuring between 8-30mm wide, and 2mm thin. 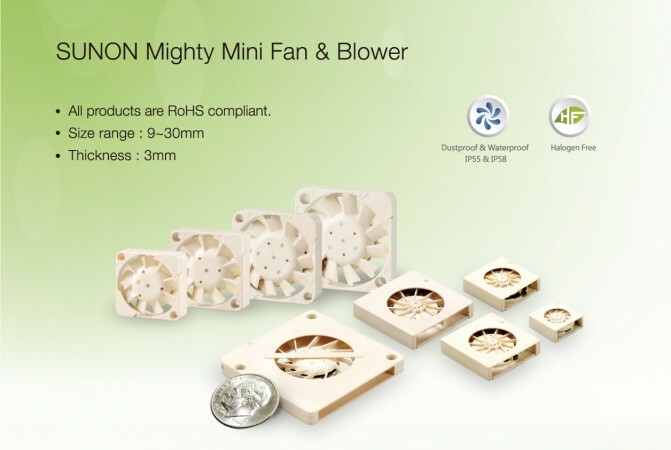 Supported by Sunon’s superior R&D on thermal technologies, these Mighty Mini fans and blowers offers the advantages of low noise and low power consumption. In addition, the Mighty Mini series are IP rated (IP55 or IP58) and suitable in outdoor applications with protection for dust and water. Sunon Mighty Mini fans and blowers are the ultimate thermal solution for design engineers with space limitation in heat dissipation for any mobile electronic devices.